EXCLUSIVE BECKENHAM ARTS LAB PHOTOGRAPHS FROM 1969! "I love these photos and I'm happy that we all did such a cool thing with that Folk/Arts venture." - DAVID BOWIE (4th December 2001). 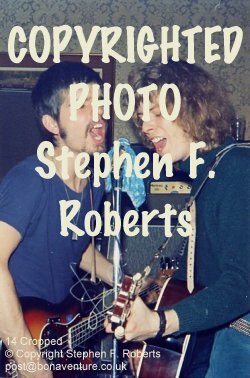 Your opportunity to purchase 10 exclusive and never before seen full colour photographs taken inside The Beckenham Arts Lab by Arts Lab performer Stephen Roberts back in 1969. Featuring David Bowie and Tony Visconti, along with other original Arts Lab performers. This special set also includes EXCLUSIVELY written contributions from: David Bowie, Mary Finnigan, Stephen Roberts, Ken 'Wild Man' Simmons, Mark Carr Pritchett, David Bebbington and others. Plus a background history including articles and information published over the years. This exclusive Arts Lab pack is available to you at the incredible price of ONLY £43. A contribution from each set sold will go directly to the Chernobyl Childrens Life Line Charity, to add to the money already raised on the David Bowie tribute evening on 6th December 2001. The photographs are printed directly from the original negatives and are not digital re-prints. These and the written contributions are supplied unmounted. The photographs all measure 6" x 9", with frames 11 and 14 being cropped enlargements, along with sixteen A4 pages of written literature. This special price is inclusive of delivery to the UK and Northern Ireland. For EEC deliveries £1.99 will be added to your order and for the rest of the world add £2.99. All payments must be in Sterling. Orders will be despatched as soon as possible, but please allow up to 21 days for delivery. Payment is only charged when goods have been despatched. © 2002 Stephen F. Roberts. The photographs on this site are NOT in the PUBLIC DOMAIN. ALL WORKS ARE PROTECTED BY INTERNATIONAL COPYRIGHT LAWS. ALL UNAUTHORISED REPRODUCTION, REDISTRIBUTION AND COPYING IS STRICTLY PROHIBITED.